A Tyroshi sellsword serving in the company called the Stormcrows, Daario is a flamboyant popinjay, all his garments spilling with lace and silk, his trident-forked beard and hair dyed blue to match his eyes. He has a golden tooth, and fights with an arakh and stilleto that feature bronze hilts that are shaped to look like naked and wanton women. He is arrogant beyond belief, and is given to impossible claims regarding his prowess at war and with women. 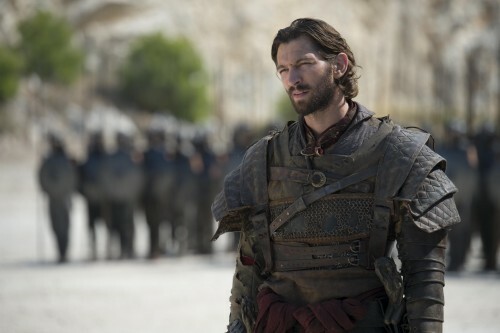 Daario is the novels is notable for wearing no or very little armor, trusting this speed and skill and good fortune to keep him alive, and so seems to eschew armor, unlike the character on the show. Daario, being a blue-eyed Tyroshi, is probably supposed to be of largely Valyrian descent, as Tyrosh was one of the Valyrian colonies. The current actor is the second to fill the role, following Ed Skrein who played the character in the third season.